The scales of justice didn’t tip accurately in this net case, it won’t be the first time nor will it be the last. 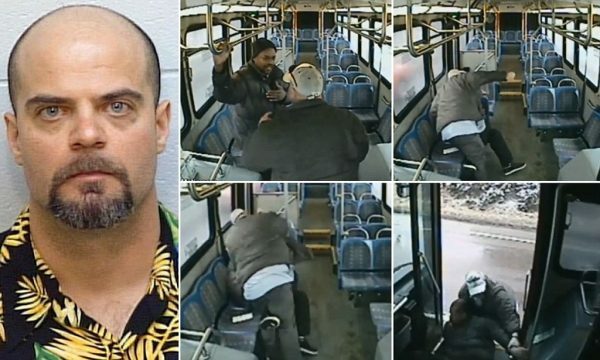 A white male bus driver assaulted a black male passenger for merely asking for directions. The bus’ video camera captured the altercation while this man plummeted his fist into the passenger and ultimately dragged him off the bus. It is very clear by the video the passenger did nothing to trigger such a beating. Although this incident occurred in 2013, it’s the things that transpired after the disturbing situation is what should be of a matter of concern. Troy Fischer who is a former U.S. Marine (we thank him for his service) pleaded guilty to the assault on Torrence Rose and faced about 1 year in jail. Reports show the prosecutors were pushing for Fischer to go to jail but unfortunately the results did not yield any jail time for the man. It seems that Fischer had been diagnosed with depression and PTSD but had never shown any signs of violence towards anyone during his time working for the company. Keep in mind Rose did absolutely nothing to the driver to trigger any type of defense mechanism but this man walked away from a brutal beating with essentially a slap on the wrist. In 2014 he was sentenced to probation and 100 hours of community service and this is the kicker, he was allowed to leave the state where this happened and serve his sentence on Hawaii because of a family reasons. The scales of justice clearly are not fair and most definitely are not color blind, had this been a black man he would not only be in jail but he’d be there for several years. It’s no secret that black men are thought of as being threatening and judged more harshly within the justice system than whites. Fischer punched the passenger 19 times, the courts would have probably given a black man 19 years in prison, one year for every punch. Fischer accepted responsibility for what he did, but the judge presiding over the case refused to send the man to jail. The bus company fired Fischer and rightfully so but he justice system simply did not do its due diligence with this case. It’s so very sad that dealings in this life are defined by race, color, gender and so forth but history has proven time and time again that if you don’t have the complexion for the protection unfortunately you don’t matter. He needs to do some real jail time or be rounded up for some rough justice..
That is an opinion. It would be cool if it was an informed opinion, not a clueless one. I read the Nebraska statute for assault. 1st degree would require major injuries, which the passenger did not receive (according to the media, he showed to the court a bloody nose and swollen lips, nothing more. It would require a concussion, broken bones, or something worse to rise to that level). 2nd degree is out, because it requires the use of weapons. So the only charge the assailant could get was 3rd degree assault, a misdemeanor. The statute does not take into account the shock value of the video, nor the color of the victims, just the degree of injury. In the US justice system, first-time offenders who plead guilty to misdemeanors (YES, EVEN BLACK ONES. ASK ANY DEFENSE ATTORNEY, DA, JUDGE, WHATEVER) virtually never get jail time, only community service and probation (he got the max on both), unless there are other circumstances, none of which was present. And it makes sense for the judge to let him serve his probation near his family. Why would you want another homeless man in your jurisdiction? He was quickly fired and is now virtually unemployable. Does the community benefit from having him around? If you can show one single case of a black man who was a first-time offender, inflicted on someone only minor injuries, and was charged with a felony just for the assault itself (w/o any additional circumstances, like burglary, etc. ), then I will withdraw what I said. But you can’t. Thank this guy for his service? Um, no! Screw that! He disgraced the USMC with his actions! He committed assault period, and should have got jail time! Other way around, you can damn near bet the black man would have been sent away! But of course, those so called scales of justice are not even! He should have thought about being unemployable now before he acted! I saw the rage he went after this man with, he was trained real well wasn’t he? Seems like you want to sympathize with this pig!